Let's hear what she thinks of this fabulous book: Me: So, honey what do you think of this book? 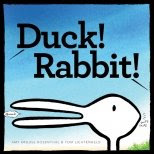 J.: "I think the illustrations are cool because she puts lots of little detail in it, I like the story because it is switched around; usually parents are clean and in this book, the parents are messy and the 'kid' is clean and not messy!" "The illustrations pop-out at you-a lot of detail and speech bubbles!" "I like the trees and the greens and browns in the picture and then the pig's stripey shirt" "and I like the writing on the chalk board in the school room and the 'students' eating from the trough." and I like the nighttime scene where they are doing 'this little piggy went to market, this little piggy stayed home...', I like how the dad has a big dirt stain on his shirt"-"all I really have to say is it is awesome and unique!" followed by a giggle!! J. used the word "detail" quite a few times in reference to the illustrations as well. I love the continuous run-on thought-process. I had trouble keeping up typing and I am pretty fast. I don't really know what I can add to that amazing asses ment except I love the book as much as Little Pea and Little Hoot! I love the switch-around message for a reminder of our own individuality!! My Mom used to call it "marching to the beat of a different drummer", in reference to me. I think these books demonstrate those qualities extraordinarily!! As I browsed her website I noticed several other new books. I already have Duck! Rabbit! 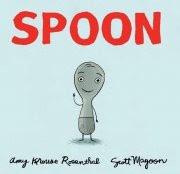 in my library collection(can't wait to share it with little ones in the Fall) and will be looking to add Spoon as well. 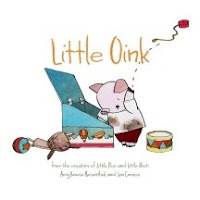 Whomever Amy Krouse Rosenthal is teamed up with she seems to shine with unique ideas!